Last year I made a new pond. You can see the whole story on the left side bar. The post was: It Took 3 Ponds. My ponds have always been very clear, so I decided it would be neat to line the inside of my 6ft x 11ft –24” to 33” deep pond with heavy stacked stones. I have very happy fish that stay in the pond year round. A pond expert told me that stacked stones would create an area for debris to accumulate. Last week some above normal temperatures gave Ted and I the opportunity to pump the pond out. I carefully netted the fish and put them into a large container with some of their original water. Then I walked in and proceeded to lift out the rocks. Ted helped me with a couple of the really big ones. I now have biceps and triceps and “bottomceps” from walking in and out of the pond. It was chaos with all the rock surrounding the pond. Ted took a picture, but I told him I would not blog such a messy scene. So what to do with so much rock. I made 3 raised beds for veggies and dry stacked the rest into a partial fence. Yes, this morning we awoke to snow. But, it didn’t last. This raised bed is in the front yard. I will be adding composted buffalo manure that I will be getting from a rancher friend. Yea! This is the year of the manure. Ted and I will be married 29 years in May and I told him that I want lots of manure as an anniversary gift. :) Notice the dry stacked little wall in the back. 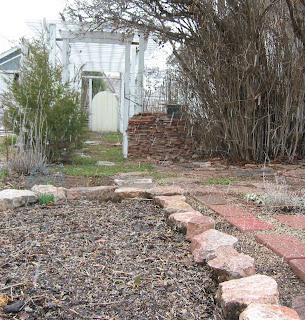 I started this little wall with bits of rock I’d find around the yard. In the country sometimes you will see circular stacks of flat rocks. We call them “sheepherders monuments”.. This bed is on the side yard. Notice the bit of rhubarb trying to get started. Ted loves rhubarb pie and I make sure to make him some. One more raised bed made from those rocks that were in the pond. 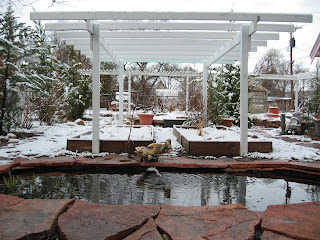 This is my Ventomatic – It is a cold frame. It automatically opens up when the inside temperature reads 72 degrees. I have had this for many, many years. I bring it out in the spring and use to to grow seedlings and harden off plants. This year I have brocolli started inside. I plan to plant it into medium clay pots and sink them into the soil. I am also planning to soon start some swiss chard and spinach in this cold frame. Jim - you made me laugh! We really do live in the wild west. Wind Cave National Park is about 10 miles away. There the deer and the buffalo roam. Ranching is one of the main occupations around here and some ranchers raise buffalo. Dear Gloria, My goodness, you have been exceedingly busy but what satisfaction you must now feel at a job well done. It is often the thought of these kinds of major projects which is worse than actually carrying them out, I always think. Also, I am a great believer in utilising whatever material comes to hand - you are making very good use of your surplus rock. A wedding anniversary gift of buffalo manure is, to say the least, certainly different. But then, dear Gloria, you are most obviously a dedicated gardener so all is readily explained! My warmest wishes to you both for a very happy and peaceful Easter. Hi Gloria, I love the “sheepherders monuments”. Hi, Gloria! And, Happy Easter! My last anniversary I asked for some boulders, so my husband probably wouldn't bat an eye if I asked for manure. Can't wait till the snow melts and I can get started on all my projects. Frankly, I could use the exercise. Hi Gloria, snow! I'm glad it didn't last! I love all your rocks. You have certainly been doing some heavy work, and soon you will see the fruit of your labor. Your pond and arbor are beautiful even in the snow, and I am looking forward to seeing them with everything green and blooming. Kate, how big is that pond going to be? I look forward to seeing it in person this summer. Deborah, it snowed a bit again this afternoon. I was actually glad. I really needed to clean house. You have a most charming home and garden. I love the arbor, the pond, the garden house, everything.